This example shows how to use uncertain objects in Robust Control Toolbox™ to model uncertain systems and to automate robustness calculations using the robustness analysis tools. Robust Control Toolbox lets you create uncertain elements, such as physical parameters whose values are not known exactly, and combine these elements into uncertain models. You can then easily analyze the impact of uncertainty on the control system performance. Uncertain continuous-time state-space model with 1 outputs, 1 inputs, 1 states. Type "P.NominalValue" to see the nominal value, "get(P)" to see all properties, and "P.Uncertainty" to interact with the uncertain elements. Suppose we have designed an integral controller C for the nominal plant (gamma=4 and tau=0.5). 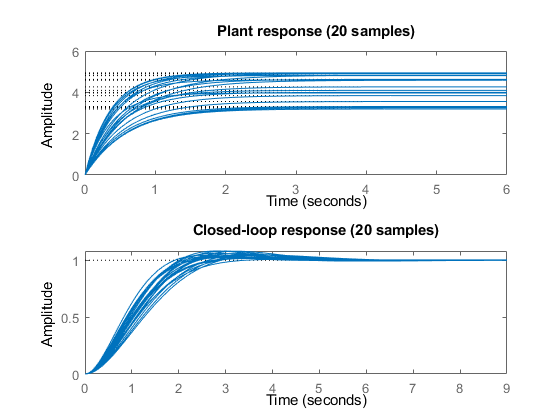 To find out how variations of gamma and tau affect the plant and the closed-loop performance, we form the closed-loop system CLP from C and P.
Uncertain continuous-time state-space model with 1 outputs, 1 inputs, 2 states. Type "CLP.NominalValue" to see the nominal value, "get(CLP)" to see all properties, and "CLP.Uncertainty" to interact with the uncertain elements. The bottom plot shows that the closed-loop system is reasonably robust despite significant fluctuations in the plant DC gain. This is a desirable, and common characteristic of a properly designed feedback system. Now we'll build on the Control System Toolbox™ DC motor example by adding parameter uncertainty and unmodeled dynamics, and investigating the robustness of the servo controller to such uncertainty. For physical reasons, the values of Kf and Kb are the same, even if they are uncertain. In this example, the nominal value is 0.015 with a range between 0.012 and 0.019. Viscous friction, Kf, has a nominal value of 0.2 with a 50% variation in its value. H is an multi-input, multi-output uncertain system as seen from its display. Uncertain continuous-time state-space model with 3 outputs, 2 inputs, 1 states. Type "H.NominalValue" to see the nominal value, "get(H)" to see all properties, and "H.Uncertainty" to interact with the uncertain elements. It is a simple matter to relate the AngularSpeed input to the RotorTorque output through the uncertain inertia, J, using the lft command. 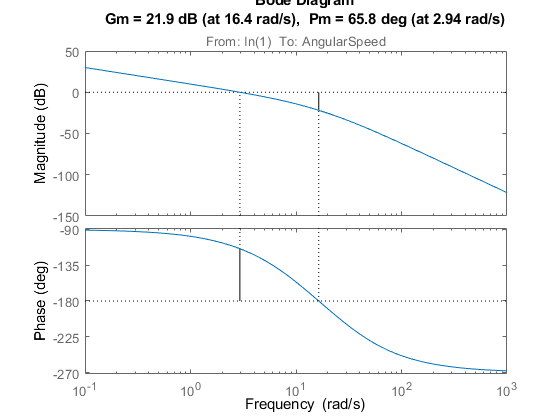 The AngularSpeed input equals RotorTorque/(J*s), hence "positive" feedback from the 3rd output to the 2nd input of H is used to make the connection. 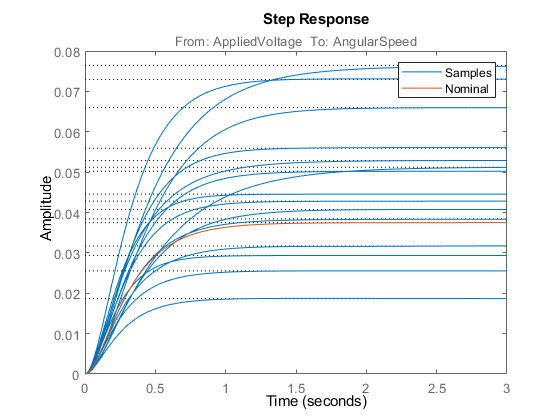 This results in a system with 1 input (AppliedVoltage) and 2 outputs, (Current and AngularSpeed). Select only the AngularSpeed output for the remainder of the control analysis. P is a single-input, single-output uncertain model of the DC motor. For analysis purposes, we use the nominal controller synthesized for the DC motor in the Control System Toolbox™ example. 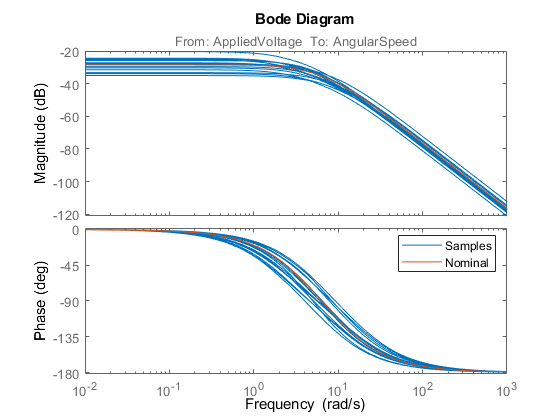 Similarly, we can compare the Bode plot of the open-loop nominal (red) and sampled (blue) uncertain models of the DC motor. In this section, we analyze the stability and performance robustness of the closed-loop DC motor system. Our initial analysis of the nominal closed-loop system indicates the nominal closed-loop system is very robust with 10.5 gain margin and 54.3 deg of phase margin. The disk margins DM for each individual feedback channel. The disk margin for the j-th feedback channel indicates by how much the transfer function Lj(s) can vary before this particular loop goes unstable. The multi-loop disk margin MM This indicates how much simultaneous, independent gain and phase variations can be tolerated in each feedback channel before the overall closed-loop system goes unstable (same as DM for single-loop control systems). Recall that the DC motor plant is uncertain. In addition to the standard gain and phase margins, we can use the wcmargin function to determine the worst-case gain/phase margins for the plant-controller feedback loop. The wcmargin function calculates the worst-case disk gain and phase margins for each input/output channel. 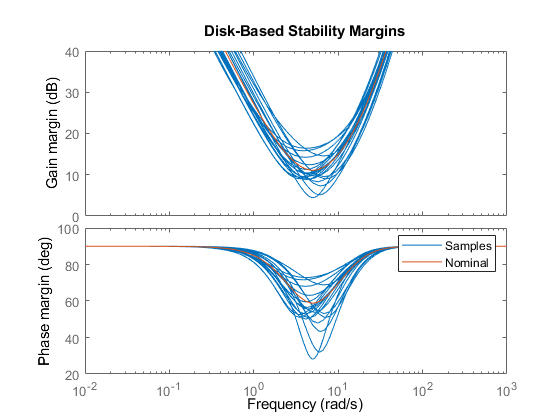 The worst-case analysis shows a possible degradation of the disk gain and phase margins, which were 11 dB and 59 degs respectively, to 1.2dB and 8 degs, respectively, in the presence of the 5 forms of uncertainty modeled in P.
The sensitivity function is a standard measure of closed-loop performance for the feedback system. 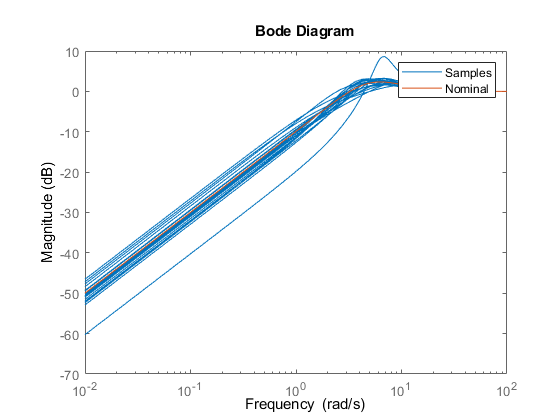 Let's compute the uncertain sensitivity function S and compare the Bode magnitude plots for the nominal and sampled uncertain sensitivity function. 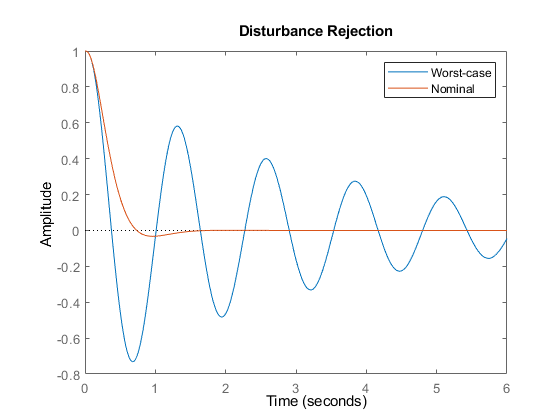 Figure 5: Magnitude of sensitivity function S.
In the time domain, the sensitivity function indicates how well a step disturbance can be rejected. 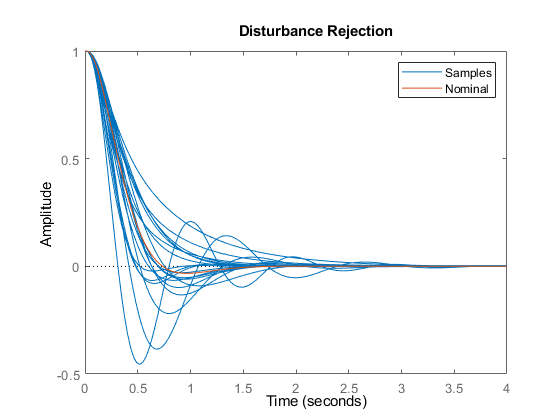 Let's sample the uncertain sensitivity function and plot its step response to see the variability in disturbance rejection characteristics (nominal appears in red). Figure 6: Rejection of a step disturbance. Use the wcgain function to compute the worst-case value of the uncertain sensitivity function gain (peak across frequency). With the usubs function you can substitute the worst-case values of the uncertainty worstuncertainty into the uncertain sensitivity function S. This gives the worst-case sensitivity function Sworst over the entire uncertainty range. Note that the peak gain of Sworst matches the lower-bound computed by wcgain.